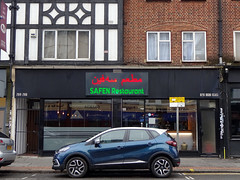 Kurdish and Middle Eastern restaurant on the High Street. It opened in January 2019. By mid-2008 it was an Indian restaurant called Khyber photo. This closed down some time in 2016. In September 2016, another Indian restaurant called Bombay Brunch photo opened up, but this closed again some time between March and June 2017. As of June 2017 there were notices in the windows stating that this was temporarily closed for refurbishment, and in July 2017 one of the owners told us that it wouldn't be reopening as Bombay Brunch and would remain closed until they decided what to try doing with it next. The premises were vacant as of July 2017, October 2017, and April 2018. A pizza restaurant called Fire & Slice photo, serving a sort of cross between Italian food and Indian food, opened some time between April and June 2018, but closed down again by January 2019. Last edited 2019-04-16 15:15:50 (version 47; diff). List all versions. Page last edited 2019-04-16 15:15:50 (version 47).